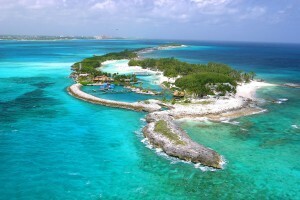 New Providence is the main destination for most travelers to the Bahamas. One of the reasons is because they are major cruise-ship destinations, often coming in from Florida. Nassau, the capital of The Bahamas, is a bustling metropolitan hub and a complete island on the northern side is designed for vacationers: Paradise Island. Here you can find resorts, hotels, restaurants, shops, nightlife, a golf course, and a casino. The gigantic Atlantis Casino Resort with its water-park/aquarium is a major attraction. Close to the bigger islands of New Providence, Grand Bahama and Andros are the most visited diving spots. A large portion of the diving industry is focused on the island’s Shark Colony and Shark feeding is a major attraction. Diving became even more popular when several wrecks were used at the set of James Bond movies, which you can still dive today.